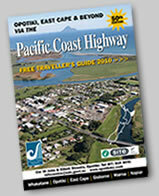 – Highway 35 around the East Cape of the North Island? This is a stunning 330km journey from Opotiki to Gisborne. Allow at least a week. 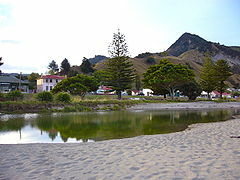 The scenery includes sweeping silvery beaches strewn with driftwood, bouldery bays, rocky headlands, towering bush-clad hills rising inland, and a narrow coastal plain dotted with small busy marae, each with an intricately carved meeting house, surrounded by maize crops, grazing cattle and horses, and the occasional subtropical orchard! Our luck was in from 7 to 14 May- we had clear blue days and turquoise sea, soft orange and lavender sunrises and night skies rich with stars on black velvet. We chose to stay two nights in each of three places. Our first two nights were at Tirohanga nestled in the sand dunes. We walked, swam and read, explored Opotiki township just to the west, and linked up with Lyn and Kate from Driftwood Dreamers (an outdoor adventure company catering especially for women). On Day 3 we explored Torere (which has a Ngai Tai church exquisite with kowhaiwhai rafters, tukutuku wall panels and stained glass windows), Maraenui across the mighty Motu River (renowned for white water rafting and canoeing), and Te Kaha. Soon after, we happened upon the Pacific Coast Macadamia Farm and Café at Whanarua, where we sampled macadamia and manuka honey icecream and came away laden with chocolate-coated nuts, fudge and other delicacies. Then we headed to our next base – Onepoto Beach, next to Hicks Bay, where we settled into a caravan beside a rocky cove. The next stage of our journey involved heading south to discover the East Cape Manuka Factory and Café at Te Araroa – a joint Maori-Pakeha venture selling wonderful healing manuka products. In Ruatoria we noticed the lively health centre, Ngaati Porou Radio Station, and modern Kohanga Reo and Kura – but we didn’t linger because we were keen to get to Tokomaru Bay for lunch. A number of surprises awaited us there. At the Surf Café – an internet café run by a community trust – we bumped into an Auckland friend. At The Ruins where Marlene Kipa and her partner have created cosy cabins for guest accommodation, a sculpture garden and a circular organic vegie garden on the killing floor of the long-defunct meatworks, we were given two live crayfish for our dinner! And we discovered the Roimata Arts and Crafts Gallery run by a local whanau, and the Tokomaru Bay Four Square store – the first (and probably only) bilingual supermarket in Aotearoa! So with our local produce we set off for our final accommodation – Judy Newell’s Rangimarie Beachstay at Anaura Bay, with panoramic views of the stunning golden beach and headlands. The highlights here were a walk through the Anaura Bay Scenic Reserve – coastal forest resounding with tui and korimako – and visiting the 1880s Waipare Homestead and orchard where Scrubbs and Louia live with their family. The old coach house next door, right beside the beach, is available to rent. The final stretch of coast road to Gisborne runs alongside more beautiful beaches – Pouawa, Tolaga Bay, Whangara, Tatapouri and Wainui. 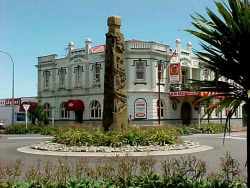 Gisborne looked bright and thriving, but it was time for home through the lovely Waioeka Gorge. Highway 35: Travels around East Cape by John Woods and Peter Quinn – a photographic essay and anecdotes about east coast characters, published in 1998. For friendly people, stunning landscapes, fresh fish, rural life isolated from city issues – and the first and best sunrises in the world – go east!